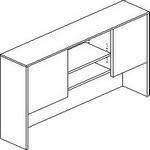 This is a high-end executive U shaped desk with hutch, storage tower and lateral filing cabinet. It offers a lot of storage space and has glass door accents. This high-end executive desk set is perfect for upper-level management, attorneys, real estate agents, and other people who require a lot of space for paperwork and storage space. This U shaped desk features a modern black look, two overhead storage hutches, glass door accents, and 6 drawers for hanging file folders and paperwork. The bow-front shape on this desk offers room for meeting with customers, clients and co-workers while stilling providing enough room for a desktop computer, monitors and a laptop. This desk can be installed into a home office or business and will look new for many years, even under full-time work shifts. It has a 5 year warranty, guaranteed to hold up and resist scratching. This full desk suite can be ordered in various sizes to insure that it fits into your room comfortably. To make sure you’re getting the best desk for your room, let our designers know the dimensions of your space and they can help you purchase the perfect desk. The dark walnut finish featured on this desk is between an espresso finish and black. It looks exceptionally modern in almost any business setting and will make a great impression on clients who visit your office. The large amount of storage will help to keep your workspace tidy and books and paperwork can be quickly put away without cluttering up your office.